For some reason, many hours later it started to work when I choosed the opion. "point to another domain in my account"
BargainLab wrote: When updating the status in orders>history (from pending to cancel etc.) in OC 2.0.1.1. the customer always gets a notification e-mail whether I select "notify customer" or not. Does anyone have any advice or mod to fix this? Thank you for your suggestion but it does not work. 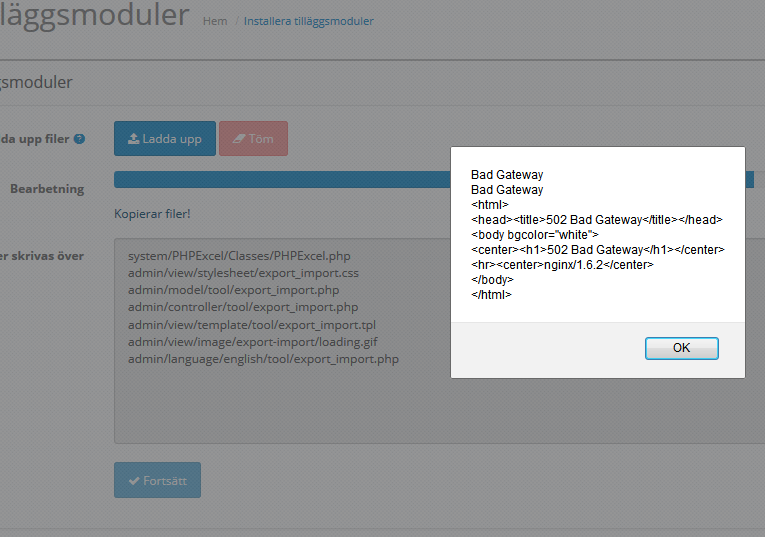 I've tryed to install in 2.0.1.1 using the admin xml-istaller, but after half install I get a popup saying "Bad Gateway". And yes, my ftp-settings are correct. I have tryed 5 times with the same result every time. Let's say you have to purchase at least 5 pcs of a product (setup in admin product page). But if you click BUY from a category page it will only add 1 to the basket. How to add "Cart" to left or right column on product page? How to add the "Cart" to left or right column on product page? Re: Where can I see if customer has downloaded his product? Where can I see if customer has downloaded his product? Yes, I know where the files is, but if a customer purchase a product for download, I need to se in admin if the custoer has downloaded the file. In 1.5 I could see in the order tabs if the customer has downloaded or not. It was so easy ... caused by a download file to the product. I have disabled them (2 pcs) but the error remains. Can the colum with fix be done by edit some files instedad of install the xml? If so, can you do it and I pay you?